The Quantico Tri and 12K overall winners (top three male and female) will be presented awards in a ceremony at 9:00 a.m. near the finish line. Age award and masters awards will be mailed after verifying finisher data. The Quantico Tri and Quantico 12K will recognize winners in the following age groups: 10-14, 15-19, 20-24, 25-29, 30-34, 35-39, 40-44, 45-49, 50-54, 55-59, 60-64, 65-69 and 70+ and be awarded at a later date. Overall awards are based on gun time. Masters and age awards are based on chip time. 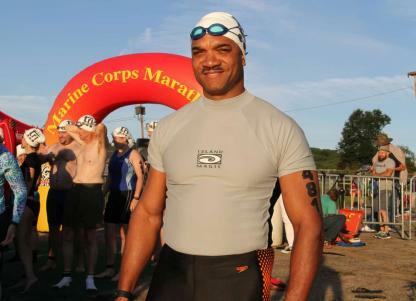 Open water swim in the Potomac, followed by a bike tour of Marine Corps Base Quantico, then a 5K run. The Quantico Tri happens annually in August and is accompanied by the Quantico 12K for those only seeking a running challenge. See who was able to navigate the run, bike and swim the quickest. Look up finishers by name or bib number. Check standings for a loved one. Even check start times and finish times for each section of the race. The Quantico 12K hosts a 7.46 mile run-only option on the same day as the Quantico Tri, each August. The 12K runs through Officer Candidates School and finishes on the famed OCS PT field. Preparation begins here for Marines, as well as many runners training for the MCM.